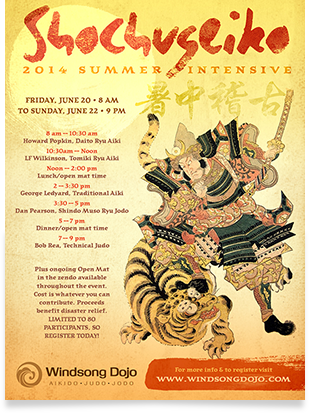 I just got back and started recuperating from Shochugeiko - the 2014 Summer Intensive at Windsong Dojo in OKC. Thank you, Nick, for hosting such a remarkable gathering! Not only was there an all-star lineup of instructors from Washington, Texas, and New York... and not only was there a record turn-out of nearly 100 participants drawn from Colorado, Texas, Oklahoma, Louisiana, Arkansas, Mississippi, Florida, Tennessee, Virginia, West Virginia, and Michigan (did I miss anyone?)... But to top it off, the proceeds from the Shochugeiko were donated to the Red Cross to help with Disaster Relief! Nick opened the intensive by working with us through Ichinoe Sensei's "1-way in, 4-ways out" system of building sets of throws that work together in randori or shiai. Apparently Karl used to call this idea, "the most advanced teaching in judo." So Nick decided to start out with that ;-) This started with some practice in getting uke's and tori's feet synchronized and how to step onto the line as uke's foot comes down (that's the 1-way in). This was a blast from the past because that is just the way that Mac McNease began teaching us judo back in the day. I'd always thought that this was a teaching preference of Mac's but apparently he'd gotten this teaching method from Ichinoe by way of Karl.